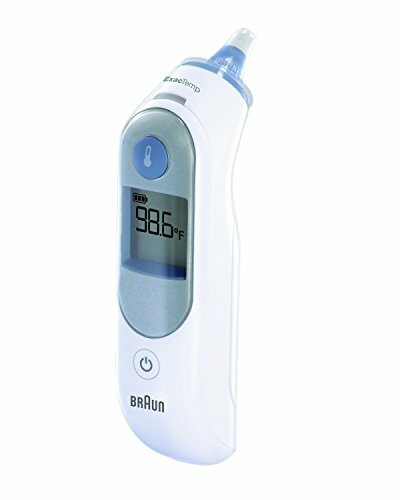 BRAUN EAR THERMOMETER: Braun ThermoScan5 is fast, gentle, easy & accurate, making it great for checking for fevers in infants & kids, & the reason Braun ear thermometers are used in more pediatrician's offices than other children's thermometers. DIGITAL EAR THERMOMETER: Braun's innovative pre-warmed tip on the ThermoScan 5 ensures accurate temperature readings for infants and kids, unlike other ear thermometers where the cool tip of the thermometer in the ear may result in lower temperatures. DIGITAL THERMOMETERS FOR KIDS & ADULTS: With innovative designs & easy to use controls, Braun child thermometers are great for adults, too. Disposable lens filters for ear thermometers & easy to clean digital & forehead thermometers keep sharing sanitary. RELIABLE & ACCURATE THERMOMETERS: Braun knows that the most accurate thermometer readings are important to parents, & we designed our digital thermometers, no touch + forehead thermometers, & ear thermometers to be accurate, reliable & easy to use. THE MOST USED THERMOMETERS BY PEDIATRICIANS: Your family's health is important to you & Braun makes digital thermometers you can rely on. Compare Braun to other consumer market brands like Vicks, Kinsa, Iproven, Ankovo, Omron, Mobi, Mabis & Vive.